I’ve owned 3 Land Rovers in my life. I loved them all, big, brutish, rough as guts rattling road legal tractors that they are. The first was a dirty matt red 110” Defender pick up with a factory installed 3.5 liter V8. It had a chronically noisy gearbox that became truly deafening when I fitted a Fairey Overdrive. When our son was born, I drove my wife (in labour at the time) 50 miles up the M5 to Worcester hospital flat out, we maybe touched 70 mph twice. The noise was so overwhelming I couldn’t hear my wife swearing in loud Australian as she experienced contractions. We made it okay, oh yes, and the reason we had to drive to Worcester was that was the only hospital near us with a birthing tub. Both my kids were born under water and interestingly they are both amazing swimmers, but that’s another topic. We fitted a baby seat on the cubby box in the cab and my pre toddler son liked nothing more than to push his little foot on the massive gear stick and kick the car out of gear just when I really needed to be in gear. Oh, the joy they bring. With the arrival of my daughter, and for reasons that now totally elude me, I traded that old tank in for a 110” Defender station wagon, again a V8 petrol model, it was in exquisite condition and even then, back in 1996, it cost close to £80 to fill the tank. In 1998 I traded that monster machine in for the 90” Defender SV pictured above. The young man standing in front of the car is my son aged 5, he’s now approaching 20. This Landy had a 2.5 TDi under the bonnet, I didn’t much like the sound it made, it sounded like a bread van. I missed the burble of the old V8 petrol but the diesel was a tiny bit more economic to run. This Land Rover became a vital part of the Scrapheap Challenge production crew from 1998 to 2001, it went everywhere we went, never got stuck, due to the rag top it could have camera mounts clamped to it. Lots of shots of weird contraptions hobbling along were filmed from the back of this Landy. It once conveyed 14 people in the back (they were all standing) out of a quarry and up to the catering wagon. Some of the more rufty tufty members of the Scrapheap crew were critical of my Landy's paint job, it was a light metallic green and they dubbed it ‘Bobby’s Barbie Landy.’ I wasn’t threatened, they were just jealous. During it’s hectic life on Scrapheap a lot of young men ‘had a go’ off roading at various locations we filmed at. I drove it into the sea at Pendine Sands in South Wales so we could get a better shot of the scrappy races vehicles arriving for the race, waves were breaking over the bonnet but it never got stuck. I ‘steam cleaned’ it later that day in order to ‘wash the salt off’ and then two weeks later had to replace all the brake disks as they looked like something pulled up from the hull of the Mary Rose. That was expensive, and embarrassing. In later life we used it to pull a horsebox when my daughter rode a pony, we attended numerous ‘Pony Club’ events, me looking like a tramp, all the other parents in their Range Rovers looking like the front cover of Country Life. My Landy pulled more Range Rovers with road tyres off level, damp grass than I ever want to remember. Also, having learned to drive tractors at an early age, I can reverse trailers. I don’t enjoy doing it, it’s not a task I seek out but I reversed a lot of Range Rovers and horseboxes out of gates all over the South Midlands. Oh the joy. A few years ago when our village was cut off in the snow and all the schools were closed, all the kids in the village went up to a local hill that seems designed for tobogganing and I tied a long tow rope on the back. 20 kids at a time sat on their toboggans, held onto the rope and got pulled back up the hill. It never got stuck. Last week I finally sold the Land Rover back to the man I bought it from. It seemed fitting, he’s a Land Rover fanatic and skilled mechanic so I’m sure he’ll look after it a lot better than I did. The heater doesn’t work, nor does the fuel gage, the drivers door doesn’t shut, the bonnet doesn’t open very easily and there are some bits of mysterious metal rubbing together somewhere underneath. On the last day I owned it I got in and tried to start it. Flat battery, we just don’t use it any more, in fact we’ve done less than 200 miles in it in the last year. As a final indignity to its he-man prowess, I had to jump start it from my Nissan Leaf. 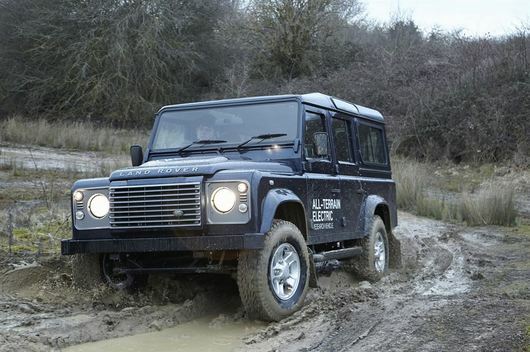 If all goes to plan, in a few weeks I’ll be test-driving the Land Rover Defender electric, one of seven all electric Defenders that Land Rover revealed at the recent Geneva motor show. I’m intrigued.